After a hard day of recreating, it’s nice to occupy yourself with a bit of relaxing entertainment. Moab can scratch that itch. We’ve got a few things to help you while away the evening hours. Offers fun, affordable entertainment in outdoor setting. 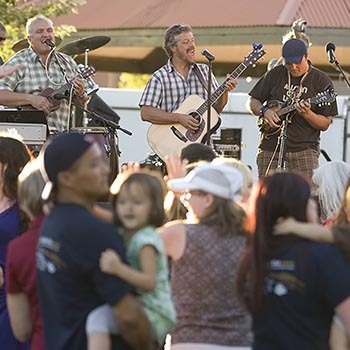 Just steps from Main Street, music and magic entertainers perform underneath a big cottonwood tree, while you pull up a bale of hay and enjoy. For people not ready to end their evening after dinner, scoot on over to some local clubs for a bit of live music. Be sure to check with venues for up-to-date lineup information.